Add boot to cart to see Best Prices online! TCX Comp EVO 2018 Michelin Boot’s crown jewel is in its sole. 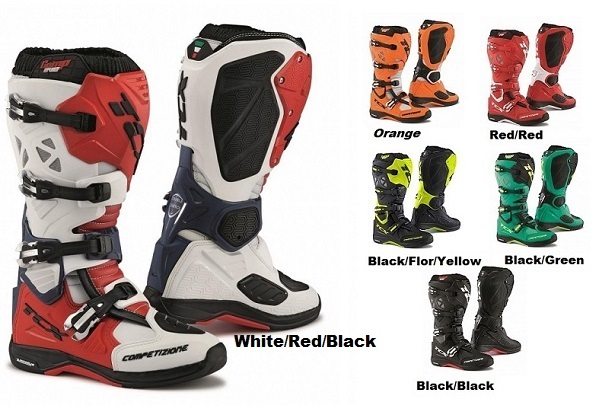 This is one motocross boot that has its roots in the automotive world. Michelin has lent its expertise in the world of tire manufacturing to TCX in order to collaborate on one of the best dirt bike boots of all time. 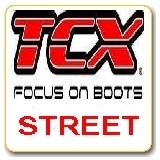 TCX Boots are already known to be of the utmost highest quality. 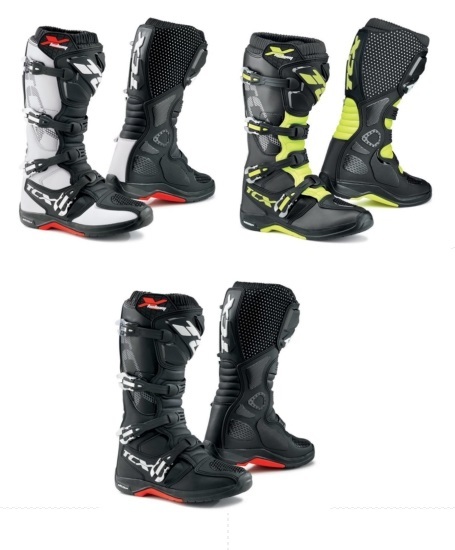 However, the addition of Michelin’s highly durable, rubber sole, definitely puts the TCX Comp EVO Michelin Boot at the top of the motocross boot pile. Not only is this dirt bike boot leaps and bounds better than all the other boots available. 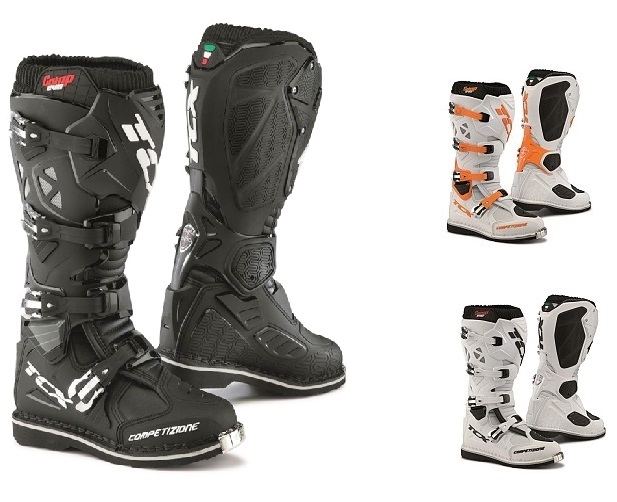 While the crown jewel of this motocross boot is the Michelin tires sole, this boot has plenty of other technologically advanced surprises in store for you. 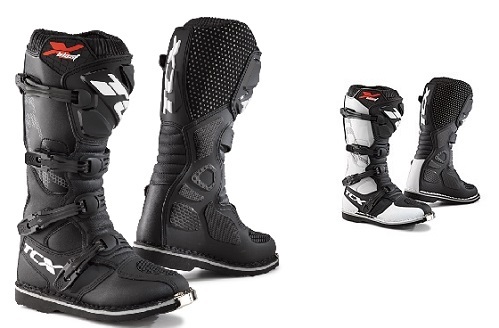 The Double Flex Control system keeps riders in their boots, without sacrificing ankle mobility. With the mobility comes protection for your ankles. The TCX Comp EVO Michelin boots give your ankles the ability to bend but not break. This allows you to safely maneuver the dirt track and grab that perfect speed! 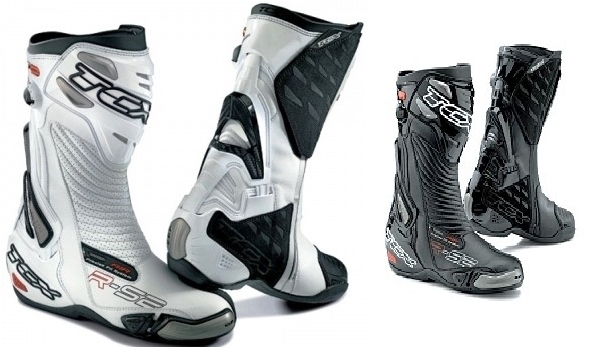 The TCX Comp EVO Michelin Boot gives riders with large calves the protection they need, without sacrificing comfort. The adjustable calf system and the brand new aluminum buckle design will help riders of any calf size into this boot with ease. This feature and many others are admired by professional rider Broc Tickle, who will be rocking TCX Boots as a featured rider for them as he tears up dirt tracks all over the world. Colors are:Black/Black,White/Red/Black, White/White, Black/Flor/Yellow, Orange,Black/Green & RED/RED. Avail in Sizes 6-14. REINFORCEMENTS: Double Flex Control System; PU adjustable shin plate; polyurethane toe guard, internal HIGH GRIP ZONE heat guard, rear polyurethane heel reinforcement BUCKLES: 4 aluminum adjustable buckles, ergonomic design SOLE: new designed, high wear resistant MICHELIN HYBRID MX sole TCX Evo Comp Michelin Boots features are: UPPER: high wear resistant micro fibre and PU frame LINING: breathable fabric with double compound PU soft padding around the ankle area CE Certification Please Select FREE FREIGHT in the mainland US when ordering! Add to cart to see Best Price online! 2017 TCX X-Helium Michelin is an excellent boot for an entry level price. Features include: Leather upper, padded front and ankle areas AIR TECH breathable lining Inside suede heat guard, shin plate PU heel and ankle guard, PU toe guard 4 aluminum micro-adjustable buckles, replaceable Michelin MX Hybrid sole Avail in Black/flor/Yellow, White/Black and Black in size 7-14 Please Select Free Freight when ordering in Mainland USA. Price shown in cart! Best prices bar none! TCX EVO COMP Boots are all new for 2018. Features include: UPPER: high wear resistant micro fibre and PU frame LINING: breathable fabric with double density foam around the ankle area REINFORCEMENTS: Double Flex Control System; PU adjustable shin plate; polyurethane toe guard, steel toe cap, internal HIGH GRIP ZONE heat guard, rear polyurethane heel reinforcement BUCKLES: 4 aluminum adjustable buckles, ergonomic design SOLE: new designed with specific tread for Enduro and MX use COLOR: BLACK,WHITE, & WHITE/ORANGE Sizes 6-14 CE Certification Please SELECT Free Freight if ordering in mainland USA.